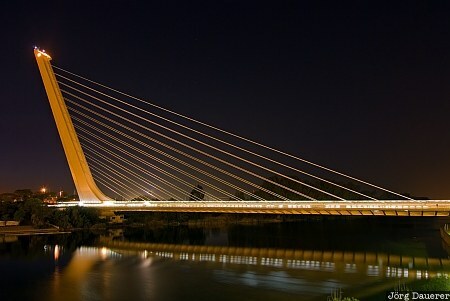 Alamillo Bridge (Puente del Alamillo) which crosses the Guadalquivir River in Seville at night, Andalusia, Spain. The bridge was built as part of infrastructure improvements for the Expo '92 fair. This photo was taken in the evening of a sunny day in March of 2008. This photo was taken with a digital camera.